If you had walked into the Fischer home in Plymouth, Michigan, on a Thursday night in the 1950s, you might have thought you wandered into a tidy concert hall. You’d hear a piano trio playing, and in the distance, you might also hear the scuffle upstairs of three grade-school boys in their pajamas, straining to listen to the music. One of those boys was Kenneth Fisher—Ken to most people—and the impact of his musical parents performing chamber music with neighbors once a week is, frankly, incalculable. “Imagine hearing those piano trios going on downstairs,” Fischer recently mused, and for a moment was lost in that cozy, euphonious memory. He has spent a lifetime and a career re-creating such memories for himself, his family and others—musicians, audiences, students, communities. 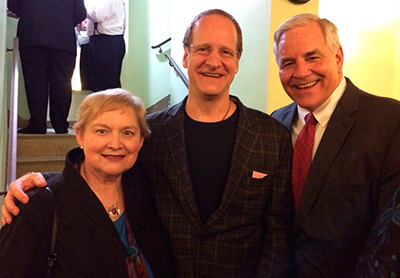 On January 10, 2016, at the culminating event of CMA’s annual conference, Fischer received the Richard J. Bogomolny National Service Award for significant and lasting contributions to the chamber music field. Much of Fischer’s work has been at the University of Michigan’s performing arts presenting organization, the University Musical Society, where he has organized more than 250 concerts in the distinguished chamber music series, a fixture of the Ann Arbor-based school for more than 50 years. Fischer is also known for developing creative residencies with luminary performance groups. Working with such distinguished names as Jazz at Lincoln Center, the Takács Quartet, the Guarneri Quartet, and Canadian Brass, and through a legendary partnership with the Royal Shakespeare Company, Fischer and his team have built lasting relationships on both sides of the stage—and the pond. Fischer is also a founding member of Music Accord, a national consortium of university presenters who commission new works for small ensembles, a considerable ambition financially and creatively. of Arts on behalf of UMS at the White House, September 10, 2015. “While Ken cares passionately about nurturing long-term relationships with musicians, he is always curious and imaginative about repertoire, interdisciplinary projects, and how a chamber ensemble thinks about its position in the larger music scene,” said Edward Dusinberre, violinist with the Takács Quartet. “As a result of his eagerness to engage with innovation, to foster a spirit of exploration, the audiences we encounter at a UMS concert are accustomed to a wide range of concert experiences, and are therefore always up for an adventure. On the other side of the artist coin is the audience, the “public” part of public service. UMS colleagues and associates will tell you readily: Fischer is all about community. In the last three decades, UMS has broadened its definition of what it means to present the arts, said Musical Society board member Mark Clague, and has gone beyond the stage with a sharp eye toward teaching young people about the arts. The UMS Education and Community Engagement programming, for instance, expanded K-12 concerts into a teaching artist program and created experiences for student audiences centered around performance. The Renegade Series, supported by a Wallace Foundation Building Audiences for Sustainability grant, connects together unique multi-disciplinary arts offerings for young professionals and presents them in alternative and unexpected venues. This year, plans call for the Renegade Series to bring adventurous options to local audiences, such as Tanya Tagaq in concert with Nanook of the North and performance artist Taylor Mac. The $380,000 Wallace grant gives UMS a tool to lure a wider diversity of faces into its fold and research help into exploring how an expanded audience base can impact its bottom line. The information gathered will be shared with the entire arts field by the foundation. “UMS has made unconventional art cool, nurturing an audience that self-identifies with performing arts experiences that challenge the mind as well as the senses,” says Clague. Of course, that leads back to Fischer’s leadership and vision. Given his origins as a youthful consumer and practitioner of music—Fischer plays the French horn and attended Interlochen Arts Academy—it’s no surprise that the Bogomolny Award is not the first time he has been recognized for public service. He has received the ISPA Patrick Hayes’ Award and the Fan Taylor Distinguished Service Award from the Association of Performing Arts Presenters. 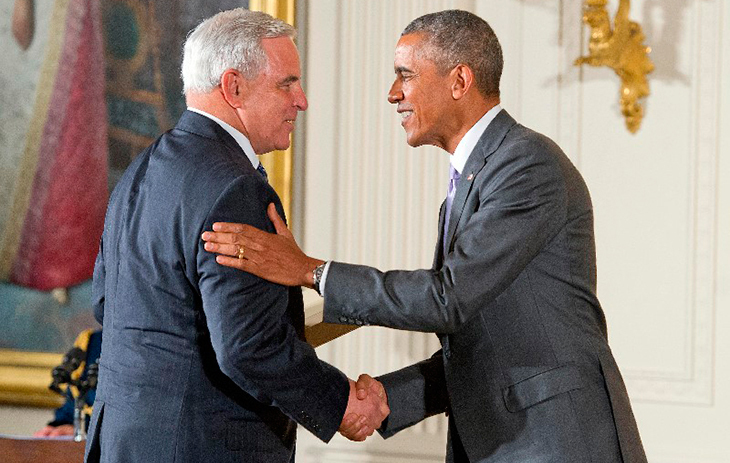 In September, he represented UMS at the White House, where President Barack Obama presented him with a National Medal of Arts for the university’s impact on communities in Michigan. Dworkin did what any entrepreneurial artist with a passion would do. He went to the Bell Tower—the UM campus Burton Memorial Tower that houses educational offices and one of the world’s heaviest carillons. It was also the site of Fischer’s office. 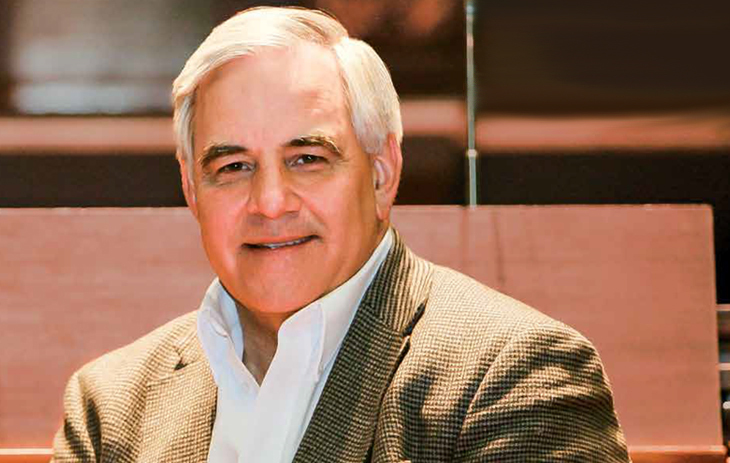 Dworkin, a MacArthur genius grant recipient, highlighted Fischer’s advocacy for excellence—in performance, administration, relationship building—but underscored that first and foremost, his mentor is a collaborator whose guiding principle is based on Washington Performing Arts founder and first ISPA president Patrick Hayes’s “Everybody In, Nobody Out” inclusion policy for the arts. Anyone who knows Fischer knows and respects his EINO elevator speech. The foundation for Fischer’s sensibility for family life began with three brothers and a “tail-ender” sister, whom Fischer helped his father—an economist and pianist who worked at Ford Motor Company—deliver at home when his mother was unable to get to a hospital. Two of Fischer’s siblings are musicians, and all four children went on to marry musicians, including Ken. 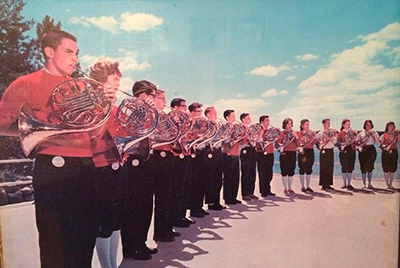 French horn players taken at Interlochen Arts Camp in 1960. Chamber music stepped decisively in his path at Interlochen, which each of the Fischer children attended beginning in fifth grade. With his horn in tow, Fischer was a member of the brass choir that played for fifteen minutes before church services each Sunday. He fell in love with brass music right there and eventually formed a brass sextet as a grad student at UM. Fischer played in the Michigan Youth Orchestra, and he was strapping enough physically to letter in sports in high school. While studying religion and math at The College of Wooster, he took a summer gig beating side rails at The Rouge, Ford’s titanic manufacturing complex. It was the height of the civil rights era in a city with tumultuous racial tension. He was the only white man on a line with sixteen black workers. Moving in unison, he and his older colleagues meshed two sides of rails together on an assembly line for eleven hours a day, six days a week. They beat the metal for twenty seconds, and then would have a ten-second respite before the action resumed. In those brief rests, Fischer began to ask the men about their families. One day at the lunch table, Fischer met a man who said he had four children; he spoke readily about three and mumbled about the fourth. Fischer persisted. Finally, the man divulged that his son was a musician. Turned out, the man was the father of the concert violinist Darwyn Apple, who had been at Interlochen two years earlier when Fischer was there. The man hadn’t wanted to reveal his son’s artsy profession to another factory worker, but lit up when Fischer guessed his identity and praised his work. More than twenty years later, UMS presented the St. Louis Symphony Orchestra, and Darwyn Apple was first violinist. Fischer invited the elder Apple and his wife to attend the concert as his guests. They did, and went backstage afterward to meet Leonard Slatkin. EINO in action. While he was working on his doctoral degree in higher education, the student killings at Kent State University in Ohio and Jackson State University in Mississippi shocked the nation, and President Richard Nixon formed the President’s Commission on Campus Unrest in 1970. Fischer knew his destiny was to be a part of that effort. He ditched the Ph.D. and left for Washington. Eventually, his career would take him to the nation’s capital for nearly two decades. Ken Fischer says his career unfolded in three stages. In the 1970s, after working with Nixon’s commission, he organized conferences for the American Association for Higher Education and the Institute for Educational Leadership, both in Washington, D.C. During those years, he formed Music at Noon, a downtown chamber music series for which he garnered foundation support. Get him talking about other arts projects he did during those years, and the stories could fill a book. In fact, he did fill a book. In 1979, he collected his best practices in Little Big Winners: 77 Ideas for a Better Conference, which was the seed for a second stage: The Learners Forum, a consulting agency for organizing conferences, which he founded and ran during most of the 1980s. In those consulting years, he also independently presented more than a dozen musical events at the John F. Kennedy Center for the Performing Arts, including a triumphant, nearly mythic, concert with The King’s Singers in 1983 in the aftermath of a debilitating two-foot snowfall, the second greatest snowstorm in the city’s history. He did go for it, and got it, and the rest is history. Fischer’s colleague Michael J. Kondziolka, director of programming at UMS, traveled with his coworker to the White House ceremony earlier this year and had the task of giving a toast at dinner. He talked about Fischer’s skills as a listener, about quickly being able to create community by making disparate people around a table feel important and valuable. He also sees his coworker in three phases of personal expression. “To make sense of Ken Fischer and to understand Ken Fischer are, of course, to understand his biography,” said Kondziolka. “A lot of people don't know about the three phases of Ken’s biography. First, he grew up in a family and school and context that highly valued music-making. Second, Ken spent his young adulthood in D.C., and he figured out what it meant to be an operator within systems. Alicia Anstead is editor-in-chief of Inside Arts, the magazine for the Association of Performing Arts Presenters, for which she also coproduces the annual APAP|NYC conference. She is the editor-in-chief of The Writer magazine and editor and co-founder of the Harvard Arts Blog for the Office for the Arts at Harvard University, where she teaches journalism, and is content strategist for one of the country’s largest student-focused annual arts festival, ARTS FIRST.